Since suspending registration, we have been working on the best possible solution to offer the remaining 15,000 entries for the 2013 Bank of America Chicago Marathon. We have determined that on Tuesday, March 5, registration will reopen as a lottery. While this is a departure from our traditional registration process, we believe it is the most fair and efficient way to address this unique situation. 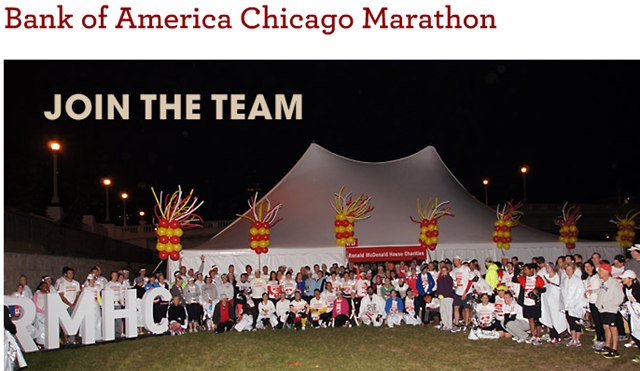 For more lottery details and Q&A, go to: www.chicagomarathon.com/lottery. Interested runners can enter the lottery at chicagomarathon.com starting on Tuesday, March 5, at 12:01 a.m. CST until Thursday, March 7, at 9 p.m. CST. From those entries, 15,000 names will be randomly selected to fill the remaining spots in the 2013 Chicago Marathon. Those individuals will be notified on Tuesday, March 12, and they will have until 9 p.m. CST on Thursday, March 14, to complete their official registration. We realize the impact these registration challenges have had on our supporters and we are grateful for everyone’s continued understanding. As a local, multi-year finisher of the Chicago Marathon, I am saddened by this news. The entire city of Chicago and the local running community stands behind the Chicago Marathon and each year looks forward to this mammoth event. Although, many runners may feel as if they have outgrown the race and look for smaller, less iconic events, there is no doubt the Chicago Marathon has become a tradition for many of us. Many runners go back year after year, despite the crowds, despite the cost. We plan not only our running schedule but our lives around this race. We do it for a variety of reasons. Many do it to run, train, race & bond with our local running community. Others do it to challenge themselves. Some just want to be part of something iconic. Others want to be able to take to the streets just one day a year with the elites who vie for the big money, notoriety and the chance to prove they are the best. For many, to just be on the same streets with these amazing athletes is an honor for which we do not take for granted. For the reasons above and many more, an inordinate amount of people, if they were able, were sitting at their computers at noon on February 19th ready to register for the 2013 Chicago Marathon. We were all nervous. Fresh in our memory was the Naperville Marathon fiasco, which despite the initial poor decisions by race directors and all the negative publicity, ended up selling out in one day. There was no doubt that if we wanted to run Chicago, then we needed to register immediately. And we tried. I knew that people who had jobs without computer access or those who were sitting in the hospital with a loved one, or those possibly helping at their child’s school at noon on the 19th had a high likelihood of getting shutout. I was definitely feeling the anxiety not only for myself but also the others who I knew would never get registered before it filled. Then the inevitable happened, registration opened and the entire registration system (via Active.com) immediately collapsed, locked up, allowing only intermittent, random registrations to trickle thru. To be honest, I didn’t know if I had even gotten in or not. I never did get thru all the registration screens despite hundreds of attempts. There was so much uncertainly and I just didn’t know. I discussed the Registration Nightmare HERE. After 9 days of waiting, the announcement was made that the remaining slots will be filled via a lottery system. More uncertainty and waiting for those who want to run but have yet to garner a spot. Even charity runners will be thrown into the lottery. Those charity runners who get selected in the lottery will go about business as usual. The charity runners who don’t get selected will quickly soak up the charity’s post-close slots. As I understand it, each charity has a specific amount of spots which they are able to offer after the registration process is closed. They normally use the spots for NEW runners, who have not ran for them previously. Its a way for them to raise additional charity monies by being able to offer up a registration for a closed race and basically get someone to run for charity who possibly wouldn’t do so otherwise. It’s a a win-win. Runner gets into a closed race. Charity is able to raise additional funds via the “new” charity runner. For this reason, the charities prefer us alumni runners to register while the race is still open so that we don’t soak up those “extra” positions. What does all this mean? If you want to run, enter the lottery. If you REALLY want to run, start looking over the charity list HERE. There will be fewer charity spots open this year than in previous years. It is inevitable that some of the runners who have already committed to running for a charity will not get in thru the lottery; therefore, they will get first chance at the post-close charity slots. If you contact the charity now and commit, then you’ll be “on the list” for the first slots available after the close. If a particular charity doesn’t call to you, join me in running for Ronald McDonald House Charities, we would love to have you! More info HERE. Good luck to all of you who are still looking to register. I hope you get in via the lottery. I know you’re anxious. I’m anxious for you! I’m also anxious to see how registration changes for future Chicago Marathon events. I anticipate the lottery system will be a permanent fixture for Chicago and we will all be vying for coveted lottery slots in the years to come. I don’t look forward to that. It makes me sad because I really do love running the Chicago Marathon. I love being able to drive in, park on race morning, run the race and then drive back home to my family without any having to hassle with travel plans, hotels or unknown cities. Therefore, I’m planning to enjoy this year as if it’s my last because it very well may be the last time I get “in” to run the Chicago Marathon. This entry was posted in Running and tagged Chicago Marathon, Chicago Marathon goes to Lottery Registration System, Race Lotteries, Registration for the 2013 Chicago Marathon, Registration Lotteries for Races, road racing, Running by tootallfritz. Bookmark the permalink. I think we were lucky that Chicago had open registration for as long as it did. I’ve never tried to register for any other WMM event, but I know NY has been on a lottery or qualifying times for awhile, and obviously Boston requires a qualifying time. This year’s solution certainly isn’t ideal, but I think we should be happy with how long we were able to get into Chicago just because we wanted to, and without needing to qualify, etc. Maybe as a result, we’ll get a second, quality marathon in Chicago, on par with a race like the Monumental Marathon but without a lottery or qualifying times. I know but I’m still sad. I love the weekend, the atmosphere, the race itself. I also think the locals should get some sort of preference but we don’t bring the tourism $$ so that will never happen. I mentioned on my FB page yest afternoon (or maybe on someone else’s) that the only “good thing” about this is that it would create more local, marathon distance races. The demand is there, someone will step up and I hope it’s Mel D. at Running For Kicks! In fact, I’m going to post something on their FB wall now. Yeah, I’m hoping the same thing! It would be awesome if Mel did a marathon! I know NYC sort of does a preference for locals (or did through 2012) – you can get it through the NYRR 9+1 program – run 9 NYRR races and volunteer at 1 and you get guaranteed entry into the marathon. It’s a big commitment of time and money (races aren’t cheap, and I have no idea how many races you have to choose from) but it’s something. I am not anxious over it. Will just give the lottery a try and see how it goes. Usually charities are allotted a certain number of registrations to recruit applicants to raise funds. Last year I got in sold-out Chicago Marathon with less than 3-weeks to race by buying and unused registration from a charity that was unable to find someone to commit to the fund-raising. Last year charities were allotted certain number of registrations, but they were bound to pay for them even if they didn’t recruit sufficient number of volunteers. Maybe they do it different this year…I don’t care. I don’t care much about races that sell-out as soon as they open. Just look for other events that don’t have this issue. I got into NY and circumvented the lottery cause when I applied I had run a sub 3:30 marathon and that gave me “guaranteed” entry. Maybe Chicago should model themselves after ING NY and offer something similar? Or…just add another wave and make more money! I like the “just add another wave”. I’m all for it going bigger if they can still manage it. Let’s make this the biggest marathon in the world. LOL! LOVE it! Well I was one of the lucky ones who got through. I guess I’m on your naughty list because I’m traveling to it and it’s my first time running it. I am running for a charity, but not one on their list. I’ve lost two dogs to cancer so I run for Chase Away K9 Cancer. Small charity, big cause. Also this could be my last marathon. I’m coming back from a bad stress fracture. I didn’t think I’d ever run again. But I’m back out there. Now with a goal and a cause. I’m sorry for all those who didn’t get in and have to do the lottery. I fought hard for my entry. Don’t hold it against me please. Best of luck to all runners. See you there! You are not on my naughty list. I’d love to travel for races but its too hard with the kiddos. Congrats on getting in, you’ll love it. Enjoy! I’m really hoping to run Chicago next year so I was pretty sad to hear about the registration snafus and the follow up lottery. If it is a lottery next year I’ll try my hand at entering but otherwise I guess I’ll have to find a back up race in case that doesn’t work out!